Deadly New Designer Drug Reaches Loudoun County, Va.
A new designer drug known as "25i" is being blamed for an incident last week in Loudoun County, Va., that sent three teenage girls to the hospital. 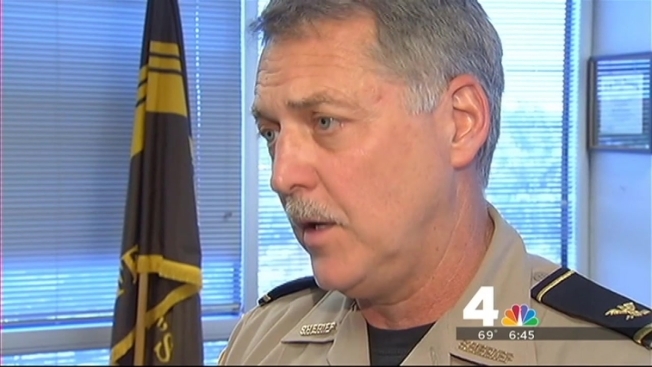 The Loudoun County Sheriff's Office is using the incident as a warning to other parents. "This is very, very dangerous," said Loudoun County Sheriff Mike Chapman of the drug “25I,” also known as “NBOMe (N-bomb)” or "Smiles." On April 14, the first day of spring break, the sheriff's office responded to a call at a home in Lansdowne. Deputies found three girls inside, ages 13 to 18. One reportedly was shouting incoherently and tried to kick the deputies. The other two girls also were behaving strangely. All three were taken to a local hospital, and one girl had to be transported to Inova Fairfax Hospital for further treatment. "They were acting in some sort of violent behavior, completely not in control of themselves," said Chapman. "The deputies were able to find this drug (25I) was responsible for that." It's the first time Loudoun County investigators have seen a case involving the synthetic drug that is sold in colorful squares on strips or sheets of paper. "It is a synthetic LSD sort of a drug that's also on blotter paper like LSD was back in the day and it's certainly as dangerous if not more dangerous," said Chapman. Fairfax County narcotics investigators said they first saw a case involving the drug in 2012. Lt. Tony Matos of the department's Organized Crime & Narcotics division said his investigators have worked on a handful of cases involving 25I, including one just two weeks ago. He said he's not surprised the teenagers in Loudoun County wound up in the emergency room. "You try this drug and you are most likely going to end up extremely sick, disoriented, unsteady,” Matos said. “Some people get so irrational they strip their clothes off and run naked down the street. Let's cut to the chase. The ultimate result of this is death." The drug has been blamed for more than a dozen deaths across the country. Most of the victims are teenagers. A Fresno, Texas, family witnessed the drug's deadly impact last December. While their parents were on a business trip, 15-year-old Montana Brown and his older brothers decided they wanted to try hallucinogenic mushrooms. Instead, the drug Dealer gave them 25I-NBOMe. Montana had a seizure and died in his living room. His brothers were rushed to the hospital and survived. "These kids aren't streetwise,” said the victim’s father, Eric Brown. “They have no idea what they are doing. They are just told it’s acid and they go with that. The one thing I know is if it can happen to my family, it can happen to anyone's family."